If you are even a halfway ambitious chef these days, it’s not enough to cook food and sell it. You must mill your own flour, grow your own herbs, churn your own butter, apply your own tattoos (well, maybe not that), and butcher your own meat. 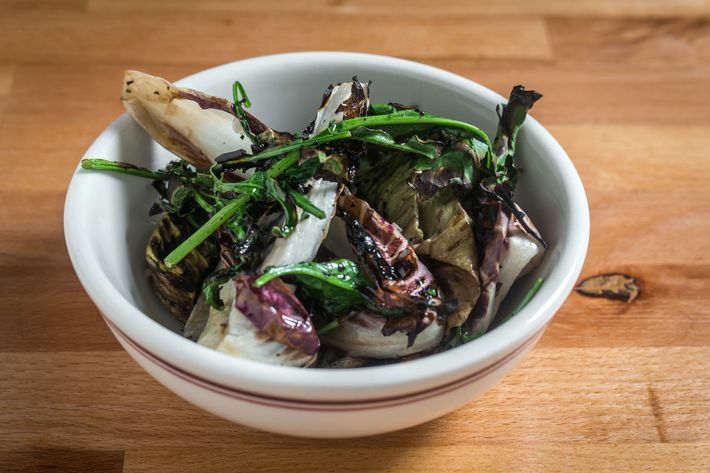 April Bloomfield is a very ambitious chef, with six restaurants on two coasts; a farm in Cornwall, England; and, as of this past October, a butcher shop on the Upper West Side. 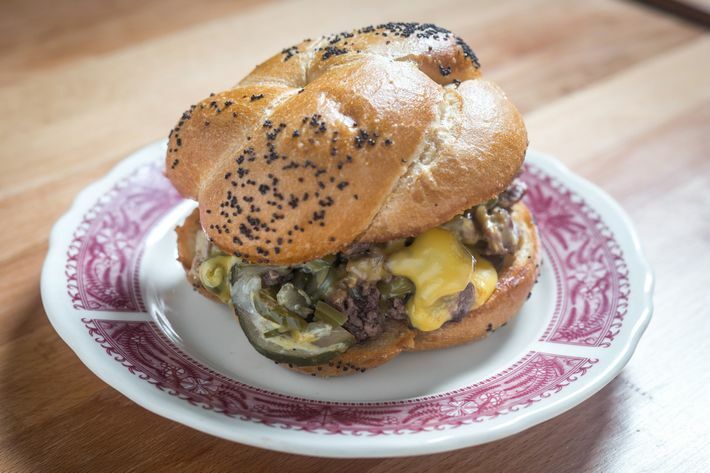 Given her restaurants’ prodigious burger output (an estimated 75,000 per year at the Spotted Pig alone), you will understand why she and her business partner Ken Friedman wanted to control the sourcing and production of her meat supply. So she employed in-house butchers Erika Nakamura and Jocelyn Guest to break down animals and grind burger meat at the Breslin and Salvation Burger, respectively, until they all got the idea and the location to give the women and their handiwork a home of their own — a place that would function not only as a purveyor of sustainably raised, nose-to-tail beef, pork, and poultry but also as a slyly delicious neighborhood restaurant in disguise. White Gold isn’t shy about announcing its mission statement. There’s a retail case filled to the brim with all manner of rib eyes, short ribs, lamb shanks, rosy-pink strip steaks, and beef marrow bones. The air is perfumed with the heady scent of bone broth infused with winter spices. Chickens twirl on rotisseries, fresh-from-the-oven porchettas rest on open-kitchen counters, meat pies and sausage rolls beckon from warming cases. Even the wallpaper in the bathroom is meat-themed. Taken as a whole, the effect on the devout carnivore is overwhelming, like how it would be for a grizzly bear to wake suddenly from its winter nap not in an empty cave but behind the smoked-salmon counter at Zabar’s. If there’s a flaw in this business model, it’s Bloomfield herself. With a kitchen whiz like that behind the enterprise, why buy ingredients you have to lug home and cook yourself when you can let her crew feed you virtually any time of day? White Gold serves breakfast, lunch, and dinner, with the common theme, of course, being meat — house-cured, smoked, ground, grilled, and confited. Morning is for egg sandwiches (with housemade bacon, ham, or sausage); lunch expands on the theme. 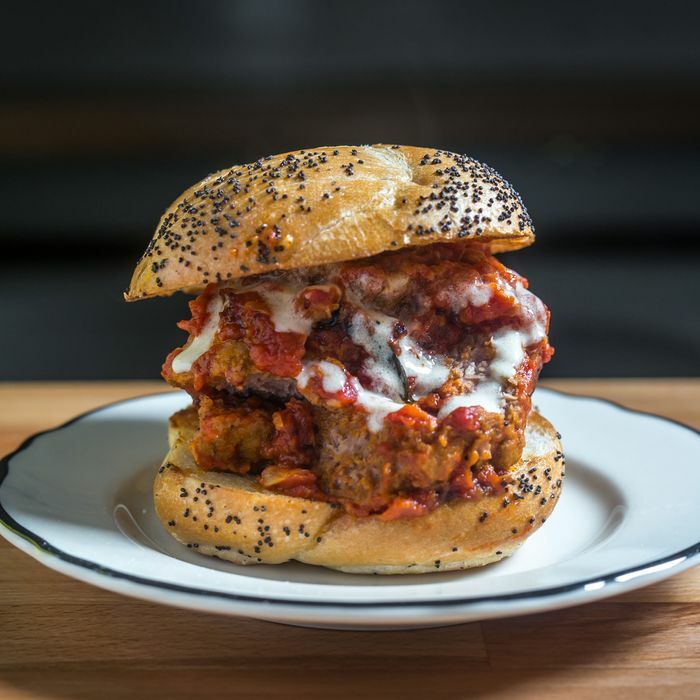 If you have the time, opt for a hot sandwich rather than one of the ready-mades: meatballs enriched with pork fat and drizzled with a cheesy sauce; a snappy hot dog tucked into a butter-griddled lobster-roll bun and dressed with mayo and kimchee; or a chopped cheese, which here approximates a super-crumbly cheeseburger infiltrated by pickles and chiles. The potato pasty would ruin even Yonah Schimmel for knishes. And there’s always a nourishing soup and a bright, herby salad for those who strive for balance in their diet. With its tufted black leather banquette, high-top and wall-ledge seating, and a smattering of groceries, the space feels like a cross between a lounge, a luncheonette, and a general store. 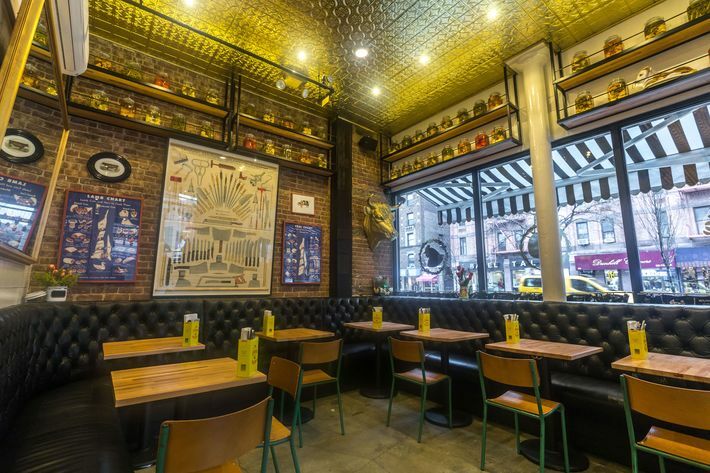 At 5:30, though, a switch flicks and the shop becomes a bona fide restaurant, a Spotted Pig for stroller moms and Upper West Siders of a certain age. 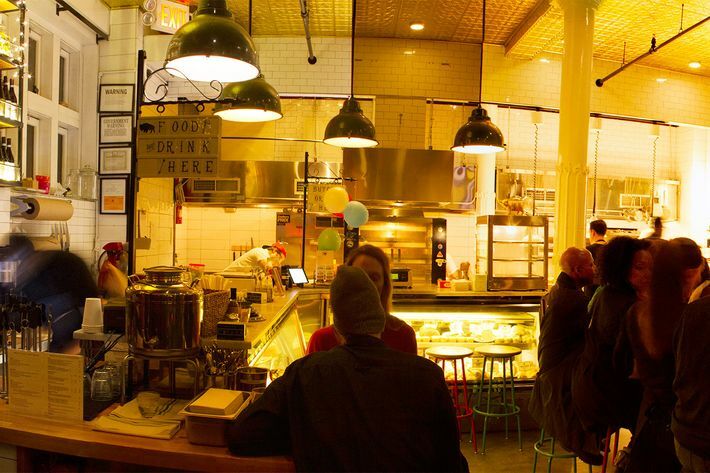 Instead of a bar and a late-night scene, there are prospective diners sipping mugs of mulled wine along the butcher counter. The offbeat setting is part of the charm. 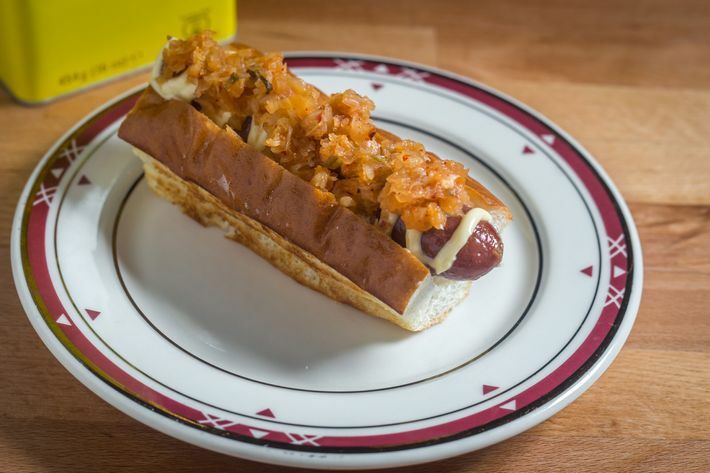 That and the classic Bloomfield gastropubby menu, as executed by chef de cuisine Robert Flaherty. Because of the context, certain items seem compulsory: We went for a plate of aggressively seasoned porchetta topped with a crackling so big we ate it with our hands like a piece of toast, and a juicy New York strip, its beefy flavor enhanced by anchovy vinaigrette. 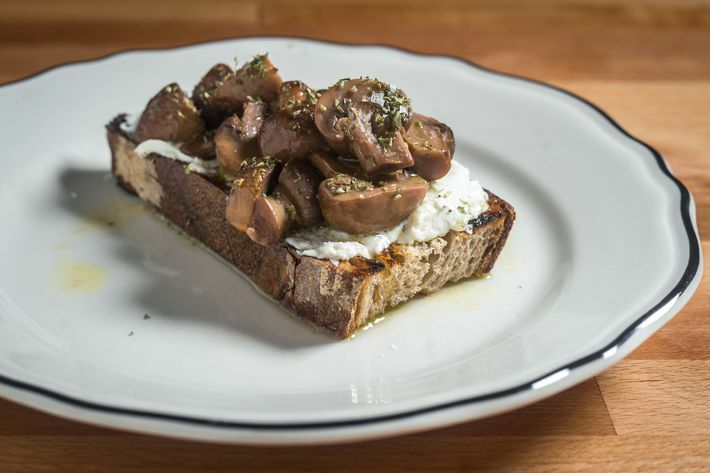 This being a Bloomfield joint, though, just as much flavor is crammed into an unassuming slice of sourdough, oiled and grilled and topped with horseradish-laced kefir cream and mushrooms. And the surprise signature dish may very well be Flaherty’s riff on pommes Anna: three mini Rubik’s Cubes of potato sliced into 25 micro-layers (yes, we took a cube home and put it under the microscope), then twice-cooked in beef fat. 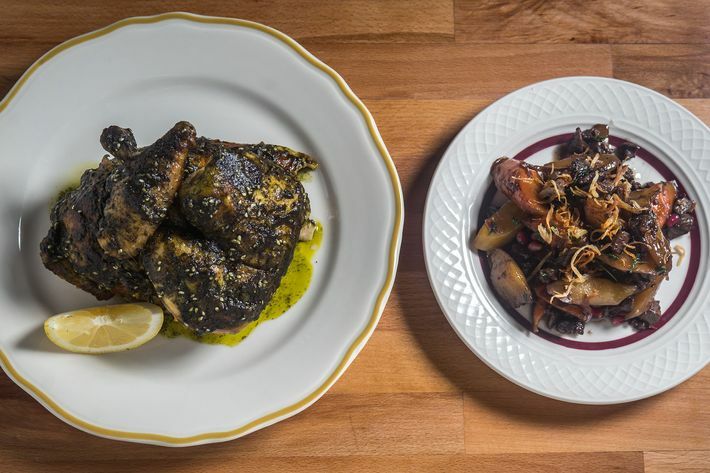 At White Gold, you see, it’s all about the meat and the fat, even when it’s a potato. 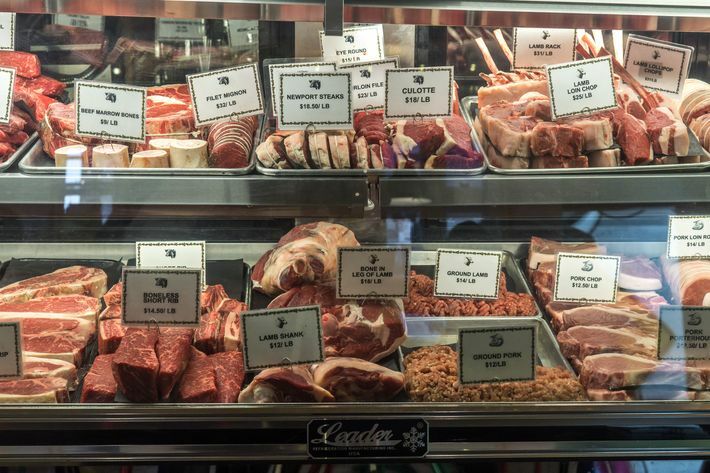 In brief: A&E Supply Co. (548 Fourth Ave., at 15th St., Gowanus; 718-635-3388) may sound like a hardware store, but it is in fact shaping up to become Brooklyn’s estimable answer to White Gold — a grass-fed-whole-animal butcher shop that doubles as an all-day restaurant. 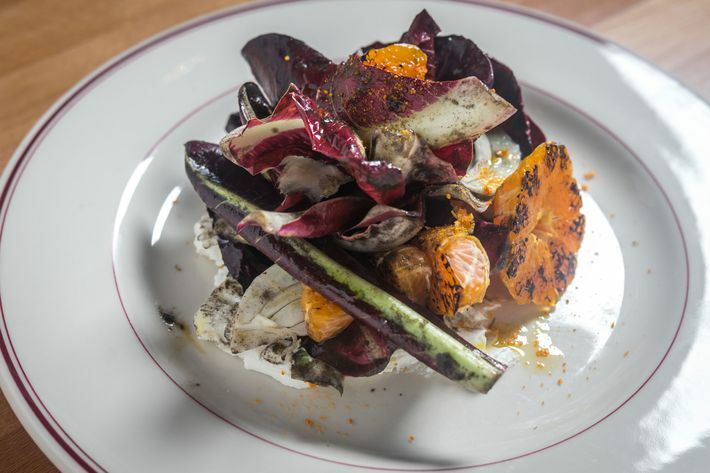 We say “shaping up” because chef Adam Harvey and partner Ennio Di Nino had yet to launch their ambitious full-fledged dinner menu at press time. 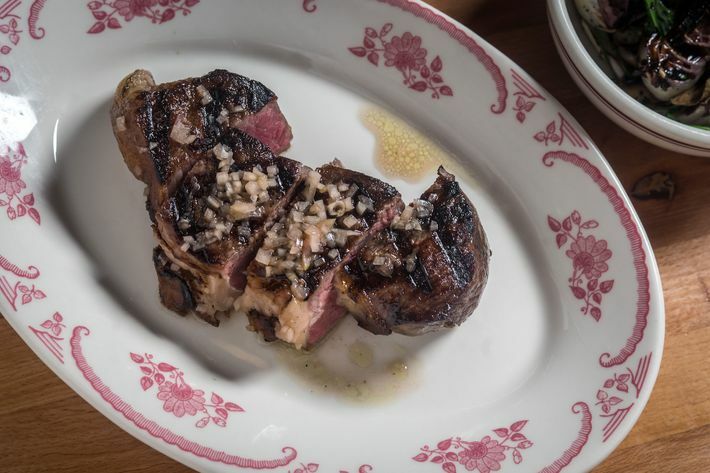 But the space (long wooden communal table, copper-top dining counter, and cozy bar) is big and handsome, the service is friendly, and judging by a couple of recent pit stops, the butcher-shop grub is terrific. At lunch, we tucked into a fantastic rare-roast-beef sandwich with lots of mayo on sourdough from Runner & Stone, a Nashville-style hot-chicken thigh with cabbage slaw on white toast, and a bowl of Pittsburgh (a.k.a. Italian) wedding soup that was the kind of dish that, on a cold day, prompts you to say goofy things like: “This is all I’m going to eat until spring.” For a return bar-menu visit on Super Bowl Sunday, we were impressed as much by a sheet tray of loaded nachos, more of that soup, and an iceberg-wedge salad with morsels of Buffalo-chicken confit as we were by Tom Brady’s strange superhuman abilities. And a well-crusted dry-aged rib eye was every bit as good as you’d hope to find at your friendly neighborhood butcher-shop-restaurant. Ideal Meal: Sourdough toast with mushrooms, strip steak with chicories, beef-fat potatoes, éclair. Note: Like the menu, the rotating list of beer, wine, and cider is short and sweet with plenty of personality. Prices: Appetizers, $7 to $14; main courses, $16 to $29. 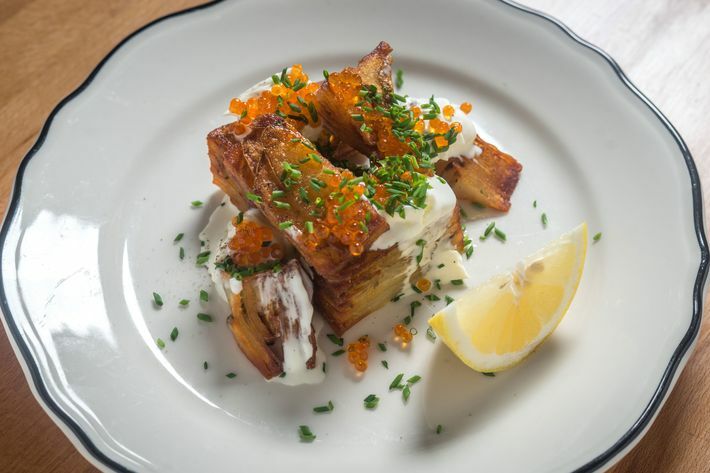 Scratchpad: One star for the fun, unusual setting; one for the takeout savory pies and rotisserie chicken; one for the polished gastropub cooking; plus a bonus star for the beef-fat potatoes.